"Carsmas" in Cars Land is undeniably magical. The neon already provides the sort of colorful feeling of romance that the Christmas holiday is associated with. 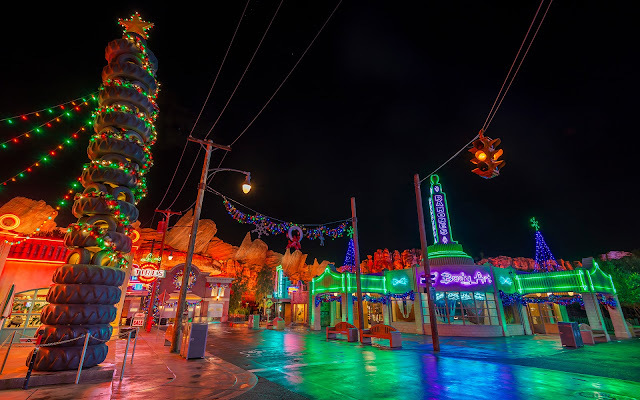 Add actual Christmas decorations--especially the visually witty type throughout Radiator Springs--and the execution of this holiday overlay really clicks well on multiple facets. The warm spirit of the season shines brightly in illuminated colors, and there's nothing more magical than seeing Cars Land in total serenity at the end of the night, after a bustling day!